Visit your local Regal Cinemas box office to purchase tickets. TIP – arrive early! 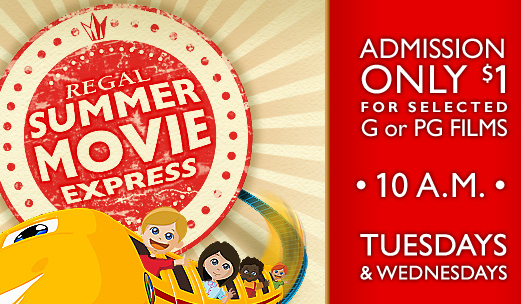 We’ve attended the Summer Movie Express in years past and many times daycare programs partake in this great movie deal. I encourage everyone to arrive 30 minutes (or more) prior to the film to purchase tickets and secure your seats. Your kids will love seeing their favorite films in theaters for a limited time! Which summer kids movies are you looking forward to seeing? We have something like this here. It is $7 per person for a total of like 10 movies it is a great deal! Wonderful way to save money and go have fun at the same time! I love that they do this every year. I have four kids so the savings helps out A LOT! This looks like so much fun to take the kids to. We love to go to the movies but it adds up with three kids fast, great way to save money. We haven’t seen a number of those. It’s a great deal, and would be a great way to stay cool on a hot summer day. You know where I’ll be all summer! I have seen most of the list, but I love falling in love with them again. We do this every summer. It is so much fun! Book of Life is a huge favorite at our house!